OnScale is used in a variety of NDE applications, from modeling transducers to wave-propagation and defect interaction through test-pieces. 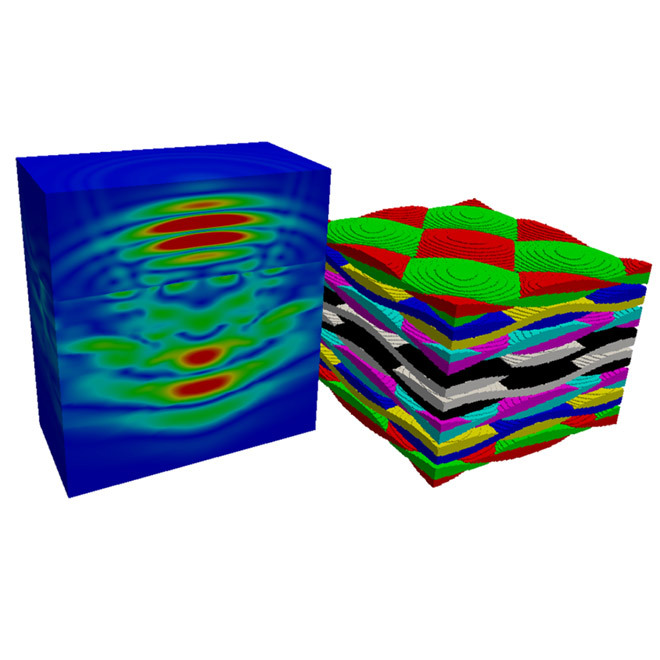 Multi-element arrays can be simulated to generate full inspection methods, e.g. FMC, or any other arbitrary arrangements. The rapid simulation times of OnScale have assisted industry in eliminating the need for fabricating expensive, bespoke test pieces for pioneering new inspection techniques. Create arbitrary array configurations, and input your own focal laws to fully analyse your sector scans. Direct contact, immersion, angled wedge and TRL inspections can all be accurately recreated. MPI allows OnScale to split problems across 1,000s of compute nodes, delivering previously impossible simulations in minutes. Combined with the infinite scalability of the cloud, this delivers supercomputer level performance to your laptop. 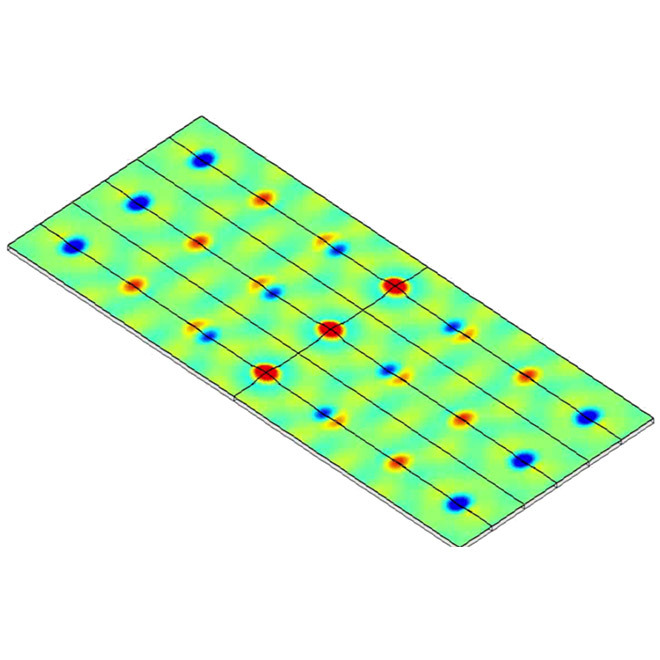 When considering inspections with complex geometries accurate simulation of mode conversion is often crucial to generating realistic results. 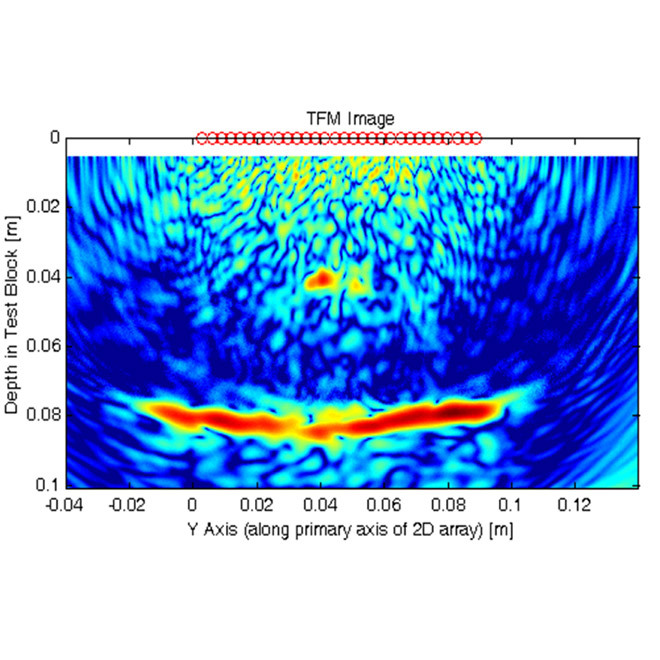 OnScale considers the fundamental elastodynamics of the test piece to demonstrate mode conversion between all wave modes. OnScale’s ability to mesh structures in exceptional detail makes the simulation of complex structures both easy and accurate. STEP and IGES formats can be imported directly, with other formats available through optional pre-processors. Full Matrix Capture (FMC) provides a versatile way of performing a complete component inspection. By running multiple OnScale Cloud simulations in parallel FMC scans can be recreated rapidly and accurately. Realistic defect geometries often produce inspection results which are difficult to interpret. 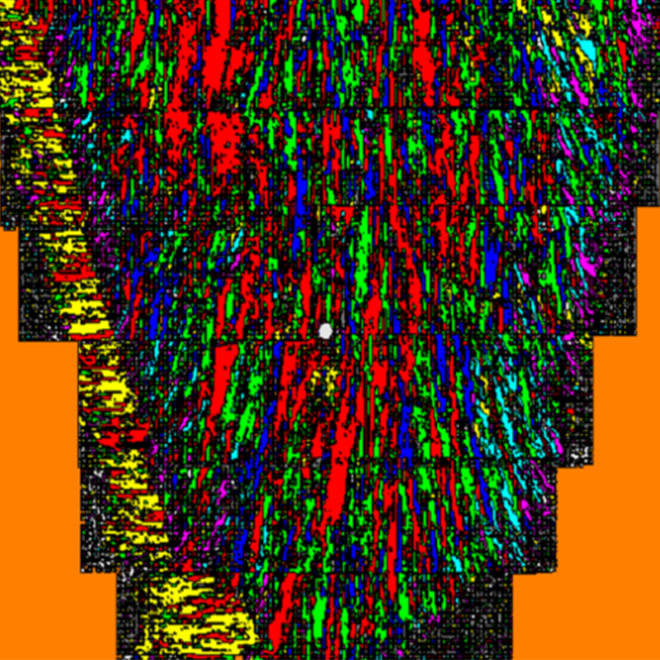 By allowing complex defect structures to be meshed in fine detail, OnScale can recreate the scattering matrix and mode conversion effects providing accurate imaging results. 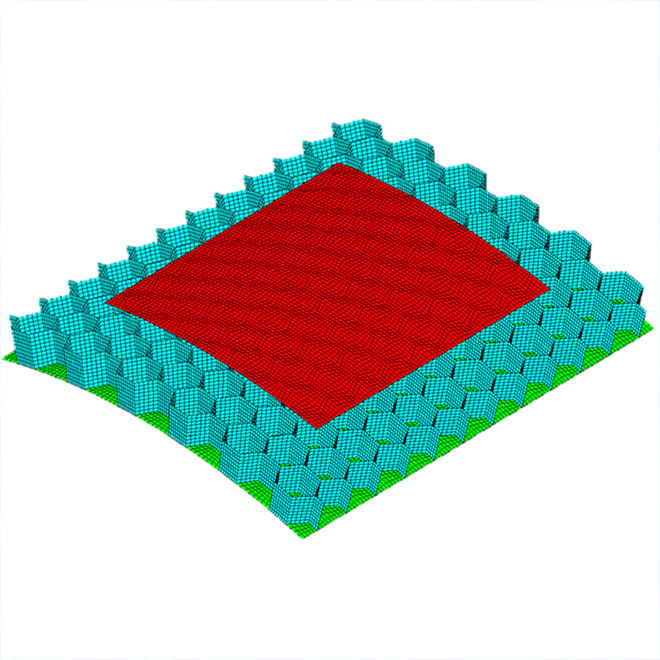 Simulating wave propagation through heterogeneous materials presents a number of unique challenges. 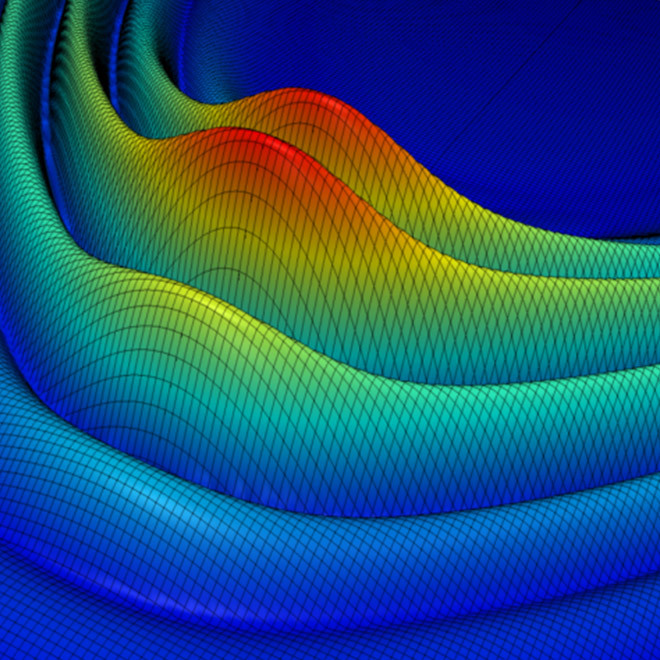 Wavefronts are continuously scattered, refracted and mode converted as they move through the component, resulting in highly complex behaviour which is difficult to recreate in analytical models. 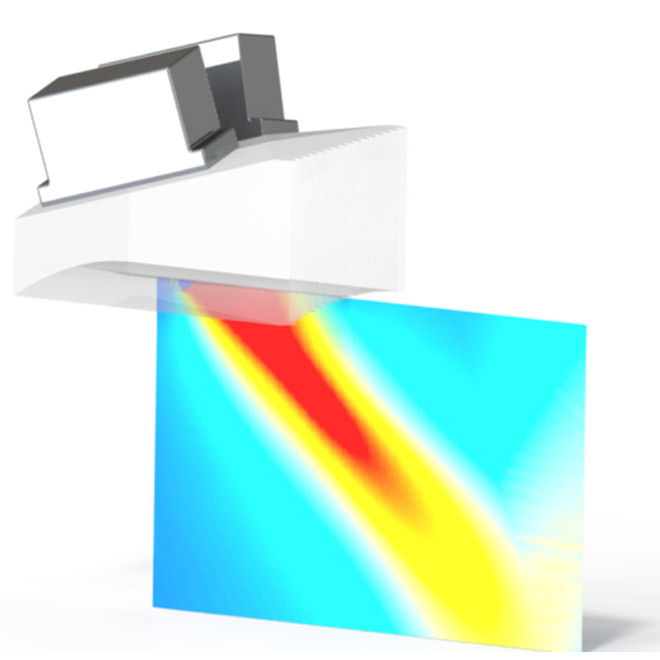 OnScale combines the capability to consider all of these effects with a selection of anisotropic material models to allow even the most complex component to be captured. 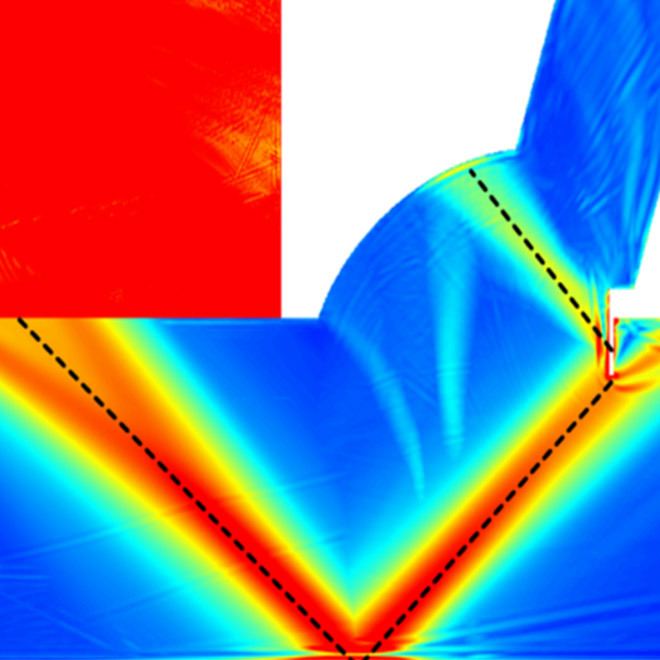 These capabilities continue to open up new applications from the simulation of Carbon Fibre Reinforced Composites (CFRP) and dissimilar metal welds. 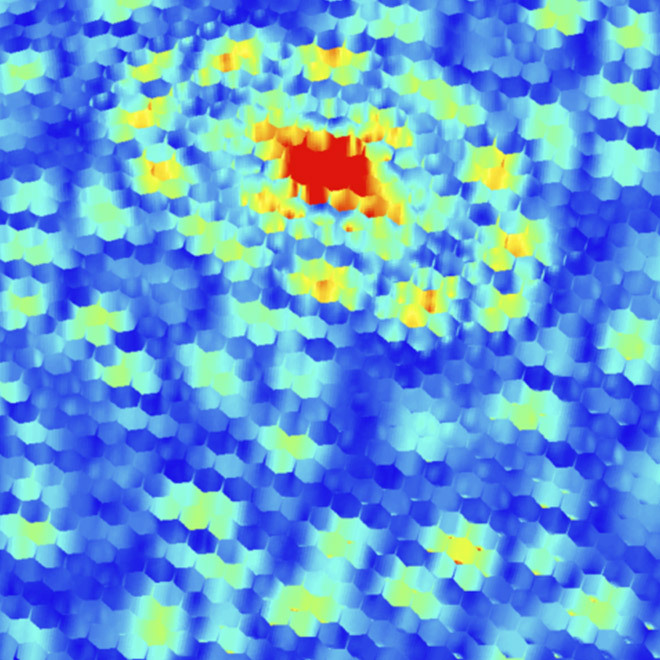 Welds with large single crystal grains and CFRP components both exhibit anisotropic behaviour. This can cause dramatic directional dependency in inspections. 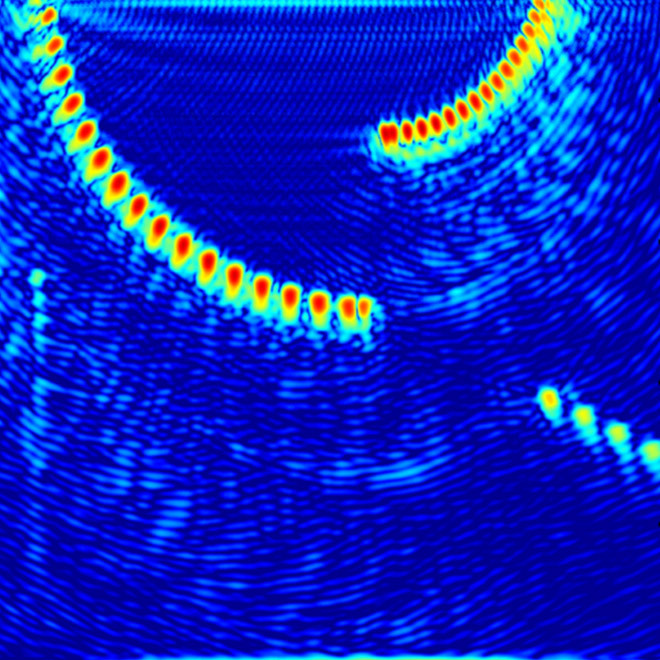 OnScale can recreate the beam distortion that can arise, allowing complex inspections to be better understood. Carbon Fibre Reinforced Composite (CFRP) components exhibit dramatic anisotropy and scattering effects during wave propagation, which often limits inspection frequency. OnScale can predict how inspections will perform in these components, allowing frequency and angle to be optimised. 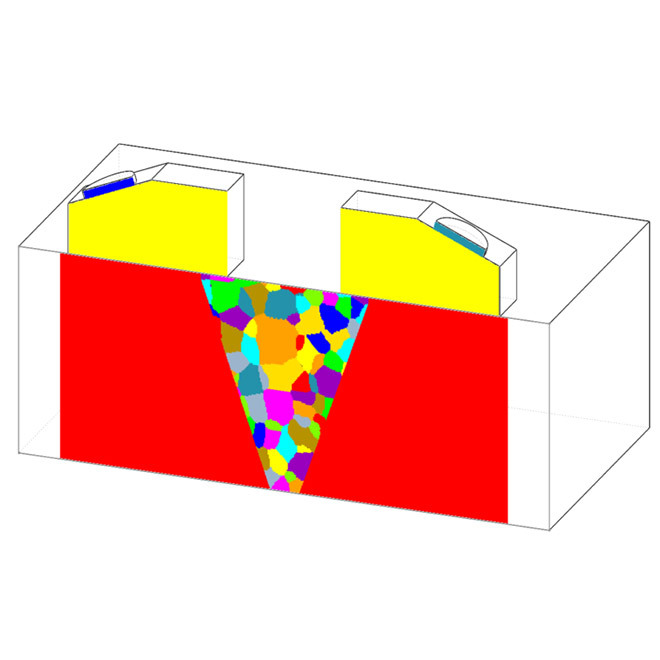 Scattering due to grain noise or laminate layers can mask critical defects. OnScale allows you to accurately assess backscatter levels, allowing the optimum inspection frequency to be selected. 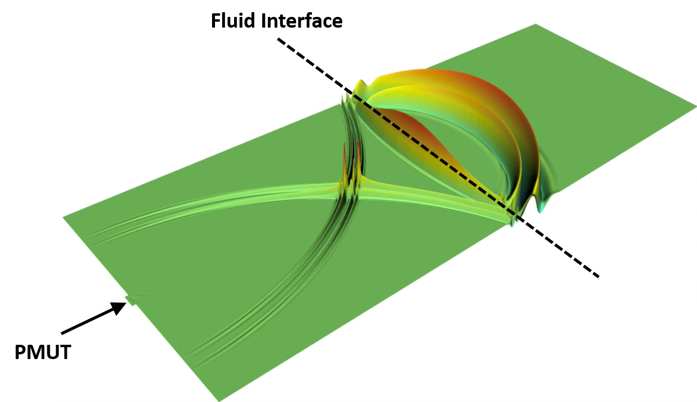 Shell elements are ideal for simulating Lamb wave propagation through multilayer laminates. Isotropic and orthotropic shells are available and coupling into bulk materials is made easy, allowing very large structures to be considered. No matter how complex the component, OnScale can capture the microstructure in high detail. Weld maps can be read in directly from simple images, or analysed in detail before importation in pre-processors. Aerospace components often incorporate complex structures such as multi-layer laminates or honeycomb sections. 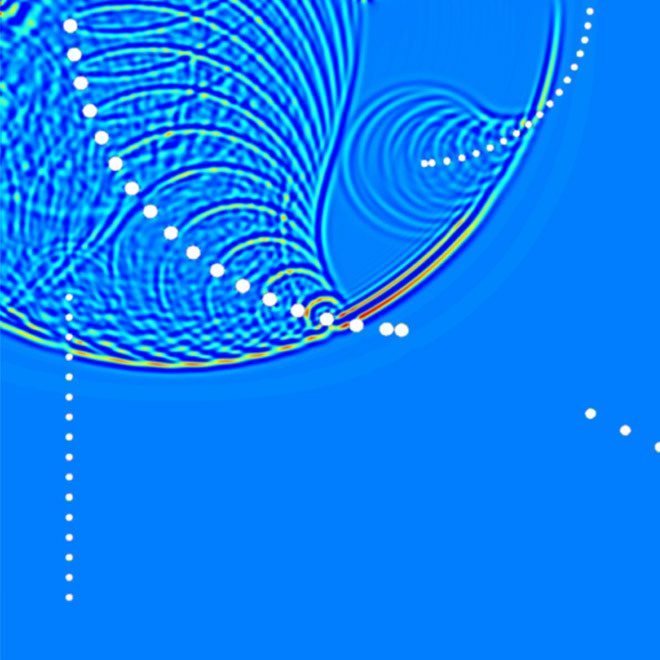 OnScale can use shell elements in arbitrary structured meshes to recreate these components to allow subtle effects such as delamination to be simulated.